"I have seen the signs. They're gateways into the nature of what they are. And we're all going there now. Because it says so." 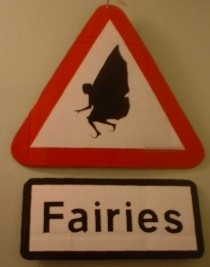 On this August morning, fairies appeared in Union Road (and they seem to have spontaneously manifested in the picture itself - click for a closer look). 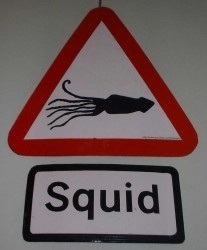 A squid on Bad Homburg Way (on the edge of Alphington). Once in place, we decided that this one was probably our favourite. Blobs on Blackboy Road. Here we were possibly exhibiting an unconscious Miro influence. A dove with olive branch brings a bit of peace to the rather noisy and hectic Marsh Barton Industrial Estate (Alphinbrook Road roundabout). A symbol of the end of the great flood, when it brought an olive branch to Noah, the dove is the classic representation of peace, standing for the Holy Spirit. The Eye of Horus looks southeast down Mary Arches Road. Horus was the ancient Egyptian lord of the skies. 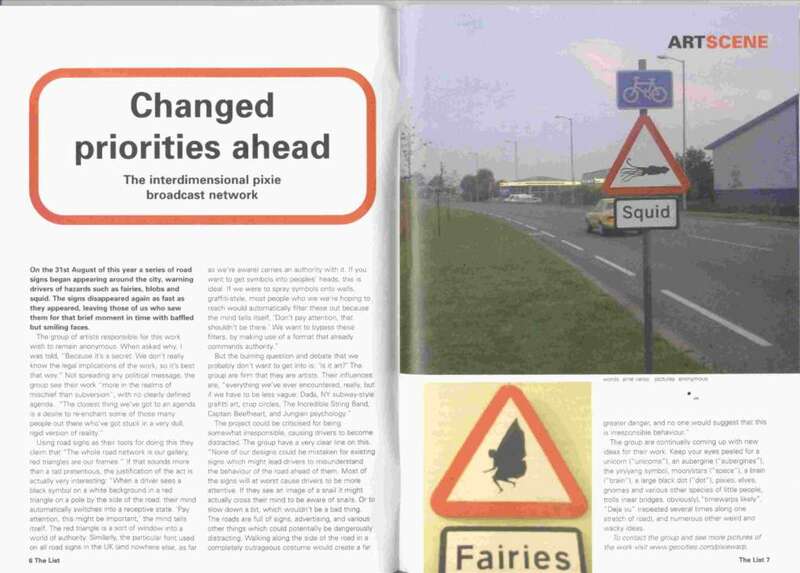 A seahorse, of which we were particularly fond, was removed within a few hours of being installed on Bonhay Road. We hope that it found a good home. Eh? A question is posed outside Henry's Bar at the bottom of Mount Pleasant Road. "That was quite fun. However, all the signs have gone and are now safely locked up somewhere secret. Ransom note will follow shortly. 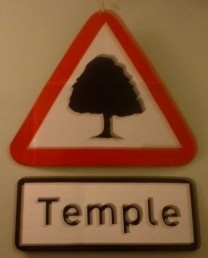 I managed to get all of the signs except the Seahorse and Tree/Temple. All the others are with me. Photographic evidence can be sent if required." At first we thought that "Steve" was missing the point somewhat. 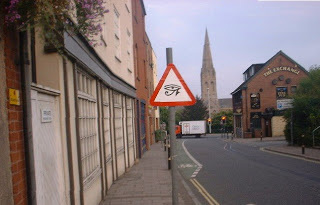 When we installed the signs around Exeter, we were freely giving them away to the public at large. We weren't expecting to recover them, as we imagined that they'd be removed before too long, either by the authorities or by individuals who particularly wanted a given piece. Had he not suddenly removed them all, we thought, they probably would have stayed up considerably longer and been seen by a much wider audience. We were quite impressed that someone felt motivated to somehow get involved with our work, but a bit disappointed that it had to be what we saw as such an unimaginative and selfish kind of involvement. "While I was driving around the city on the day, the local radio station was reporting on the locations of the signs as people were calling in on their way home. 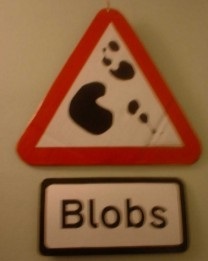 Of course I went about looking for them and came across the "Blobs" on Blackboy Rd. That's where I found the URL for your site. I called a friend who logged on straight away and told me that the pictures had already been published. Without giving too much away, I had a friend fax me the entire web site while I was still driving around. I had the fax which gave me the location of all the signs within about half an hour. The rest was easy. Just follow your instructions and get as many as possible. The radio station was saying that Devon County Council were watching their cameras and anyone seen putting any more up would be in big trouble. So they thought that the signs had only just gone up. The POLICE also called the radio station to say that they were looking for the signs and would remove any they found. I also hear that the Police were under the impression that it was the local radio pulling some sort of publicity stunt. So I got them all before the Police did." I've just had a look at the art. Brilliant, really funny! Do you want it to go on our arts section? For what it's worth from a bunch of people who were actually arrested by the police for 'guerilla ontology' in Exeter back in 1984, please consider yourselves to be Most Honoured Wudpersons. Respect! As the representative of "we are snails and we matter! Please notice us". we would like very much to thank and acknowlege your brave and most conscious actions. We were also most surprised by the buddhist symbology because as I am sure you know, we are a largly Buddhist organisation. We look forward to staying in touch and hearing of and seeing your future work. 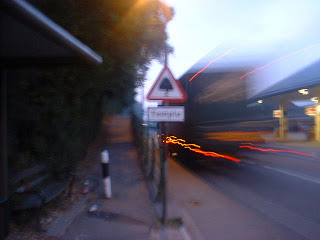 We will of course send in any reports of newly enlitened car drivers leaping out of their cars to act as lollipop persons for the smaller inhabitants of the universe. May I leave you with a pseudapodial handshake? way cool website ... love the artwork ... inspirational! Check out these people's site! One of the most interesting and unusual that we've seen. Inspirational! Thanks for sending the url. "You rock. You and your associates are beautiful people. Power to ya." "How amazing! I am overjoyed that even in Exeter the powers of life, excitement and diversity are alive and kicking." "I just stumbled on your gallery of signs and I think they're inspired. I am a design journalist and I'd love to give them more publicity. I am planning a book [the book has since been published] currently with Calmann & King on 'visual shorthand' - information design and its subversions. It is still early stages but I'd like to know if you would agree to us featuring the project and some photography in the book crediting yourselves (you'd better let me know who you are!) of course. Let me know if you're OK about this, and a bit more about the project"
"Wonderful. I've put a link to your site from mine. And I've been motivated to add those small unconsidered animals to my site also. 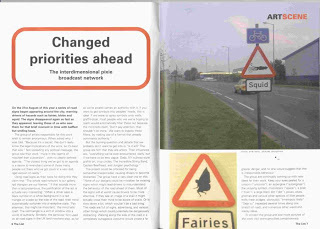 The Interdimensional Pixie Broadcast Network was pleased to discover that our first exhibition received a full colour double-page feature in the ArtScene section of the October 2000 edition of The List, the ubiquitous glossy 'what's on' magazine for Exeter.